Use for all work surfaces, trays, tote bags, PC boards, Plastics, Dip Tubes, components, storage bins carriers, packaging, film and hard floors. Complies with or exceeds all electrostatic decay criteria established for anti-static performance as set forth by NFPA and MIL B-81705, when tested in accordance with Federal Test Standard 101B, Method 4046. 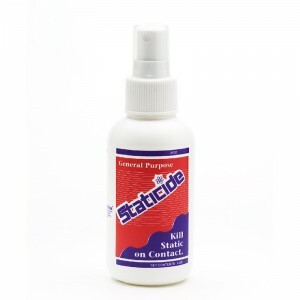 STATICIDE is a proprietary water-based formulation consisting of several quaternary compounds. On a hard surface, 1 gallon of General Purpose Staticide covers 2,000-2,500 square feet.